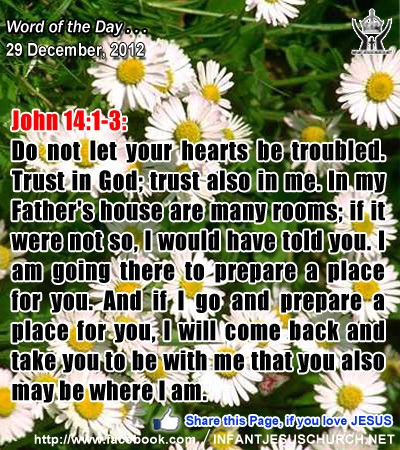 John 14:1-3: "Do not let your hearts be troubled. Trust in God; trust also in me. In my Father's house are many rooms; if it were not so, I would have told you. I am going there to prepare a place for you. And if I go and prepare a place for you, I will come back and take you to be with me that you also may be where I am." Heavenly Father, we know Jesus will come again. May we found faithful and hopeful when he returns. Thank you for sending him the first time to live in our world and take away our sin. Thank you even more for his next coming to take us to live in your world and share in your victory over sin. In the name of Infant Jesus, we pray. Amen. 22And when the time came for their purification according to the law of Moses, they brought him up to Jerusalem to present him to the Lord 23(as it is written in the law of the Lord, "Every male that opens the womb shall be called holy to the Lord") 24and to offer a sacrifice according to what is said in the law of the Lord, "a pair of turtledoves, or two young pigeons." 25Now there was a man in Jerusalem, whose name was Simeon, and this man was righteous and devout, looking for the consolation of Israel, and the Holy Spirit was upon him. 26And it had been revealed to him by the Holy Spirit that he should not see death before he had seen the Lord's Christ. 27And inspired by the Spirit he came into the temple; and when the parents brought in the child Jesus, to do for him according to the custom of the law, 28he took him up in his arms and blessed God and said, 29"Lord, now lettest thou thy servant depart in peace, according to thy word; 30for mine eyes have seen thy salvation 31which thou hast prepared in the presence of all peoples, 32 a light for revelation to the Gentiles, and for glory to thy people Israel." 33 And his father and his mother marveled at what was said about him; 33and Simeon blessed them and said to Mary his mother, "Behold, this child is set for the fall and rising of many in Israel, and for a sign that is spoken against 34(and a sword will pierce through your own soul also), that thoughts out of many hearts may be revealed." Simeon blessed Mary and Joseph and he prophesied to Mary about the future of this child and the suffering she would experience for his sake. There is a certain inconsistency for those blessed by the Lord. Mary was specified the blessedness of being the mother of the Son of God. That blessedness also would become a sword which stabbed her heart as her Son died upon the cross. She received together a crown of joy and a cross of sorrow. But her joy was not reduced by her sorrow since it was fueled by her faith, hope, and trust in God and his promises. Jesus promised his disciples that "no one will take your joy from you". The Lord gives us a supernatural joy which enables us to bear any sorrow or pain and which neither life nor death can take way. Do you know the joy of a life fully surrendered to God with faith and trust? Loving Infant Jesus, may we identify your visitation and be prepared for your action in our life today, just as Simeon Anna was ready and prepared to respond to your visitation and action in their day.